Cryptocurrencies may not be making front-page headlines at the moment for their sky-rocketing value, but that doesn’t mean that compelling developments aren’t happening in the crypto community. 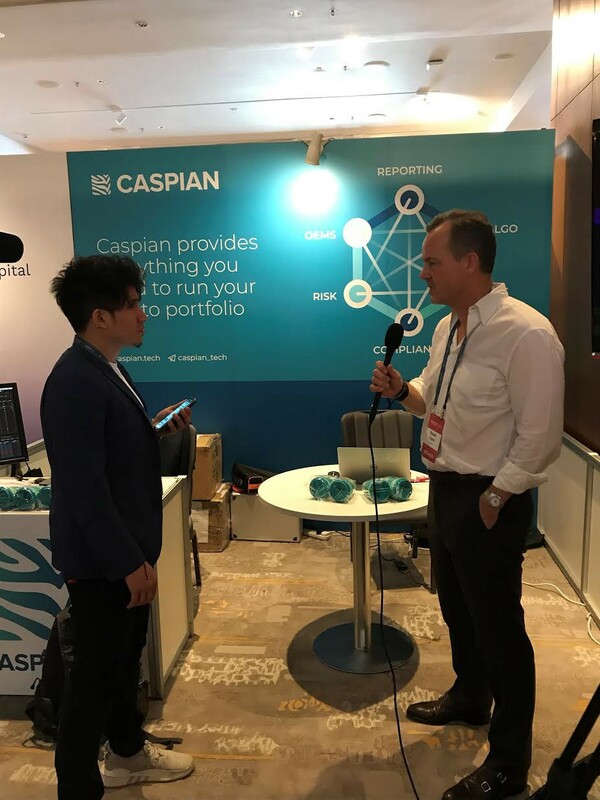 This was demonstrated recently at Token 2049 in Hong Kong, during Asia Crypto Week. The two-day conference brings together more than 2,000 crypto enthusiasts from 50 countries who are joined by 100 speakers and journalists gathering in Hong Kong to hear the latest cryptocurrency developments and their ancillary products and technologies. After attending in 2018, we were excited to be back again this year. It was a reminder of the enthusiasm and innovation that characterises the crypto movement. Ethereum co founder Vitalik Buterin took centre stage to build on the huge success of the Asian Ethereum community launching his ‘super meet’ initiative, whilst Tron Foundation CEO, Justin Sun, who was not only positive about being in competition with Buterin, but launched his latest marketing campaign, giving away $20m USD (and a new Tesla!) to fund migration to the Tron Tether pair. 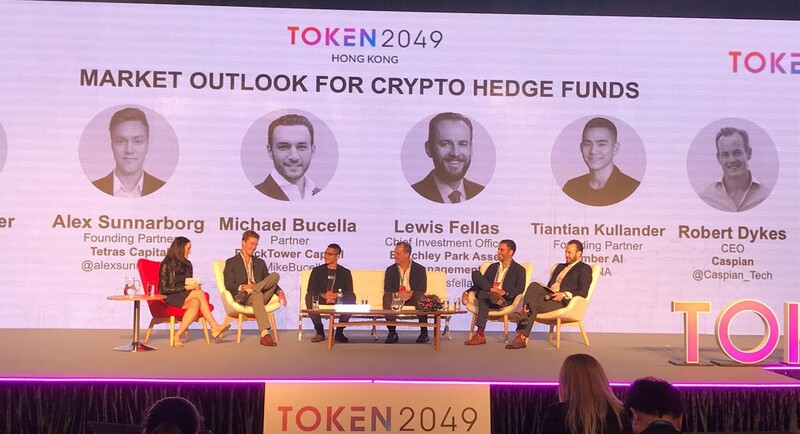 Our CEO, Robert Dykes, participated in the “Market Outlook for Crypto Hedge Funds” panel that included representatives from Bletchley Park, Amber AI, and Tetrus Capital. These crypto leaders shared their thoughts on navigating the crypto markets in 2019, and they provided invaluable best practice for maximizing the opportunities in today’s cryptocurrency ecosystem. More specifically, they detailed the current infrastructure supporting institutional investment in digital assets, touching on the several entities building or releasing custody, lending, and clearing technology or services. All panellists were positive about the infrastructure being put in place to support the growing interest in these investments. Crypto funds were a hot topic, both from a management and storage point of view, the latter being seen as particularly important in driving institutional adoption. Other discussions included web 3.0, smart-contract platforms, the prices of major coins, security tokens and blockchain for social. Other announcements that demonstrate that the industry is stronger than ever, came from SharesPost who announced their plans to change the structure of the private shares market. eToro launched its crypto trading platform in the US, and Abra announced they are looking to enable the purchase of US equities using Bitcoin. Given recent markets, the question of the direction of the industry was keenly debated — with the bitcoin maximalists (looking for decentralization and want people to be their own bank) up against those that believe that cryptocurrencies will not gain mass adoption without full collaboration with banks and regulators — both of whom are here to stay. 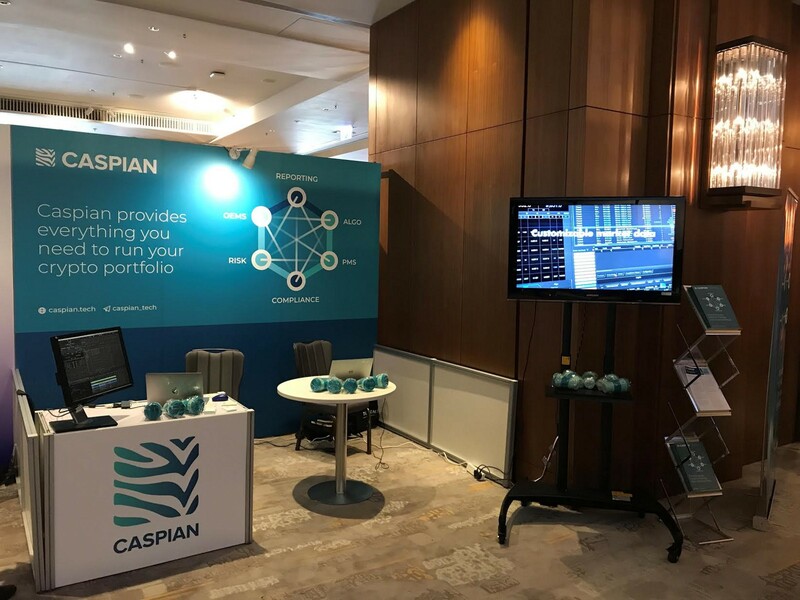 In many ways, this conference was a brilliant opportunity for Caspian to reaffirm its position in the market as the leading provider of institutional-grade investment tools for sophisticated investors, and we’ve incorporated the right framework to assist with everything from compliance to portfolio management. A conference always offers great opportunities to network with peers, but Token 2049 brings many of the major crypto players under one roof. We are excited about the developments planned for the platform this year and optimistic about our role in the decentralized ecosystem that continues to mature every day.